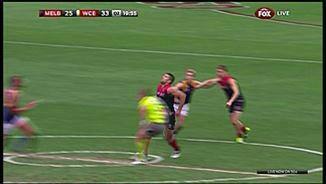 Jeremy Howe takes an astonishing grab running the wrong way. Eagles InterchangeAshton Hams off due to an injury. Demons InterchangeRohan Bail off due to an injury. This is the first time that Melbourne has been in front at any stage of the game all season. GOAL DEMONSSylvia comes out and takes a strong overhead mark about 30m from goal directly in front. He kicks his second goal and the Dees are up and about! GOAL DEMONSByrnes is taken high in the pack situation 30m from goal. He kicks for goal and puts the Demons in the lead. Howe is held onto 45m from goal on a tight angle, he takes the kick and hits the behind post on the full. It is a good sign for Melbourne supporters that their side is being competitive early on. The question is if they can maintain it. GOAL DEMONSGrimes finds the chest of his co-captain Trengove 48m from goal. He comes in and kicks it straight through the middle for a goal. 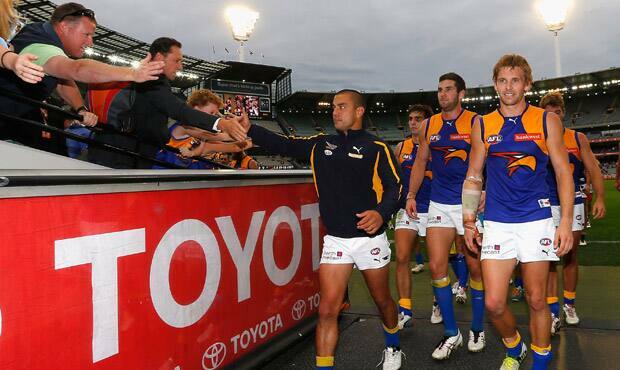 Melbourne are doing well in this early part of the game and the Eagles are having trouble shaking them off. GOAL DEMONSSylvia is being held onto 50m from goal, the umpire awards the free kick. He kicks truly and the Dees are on the board. GOAL EAGLESThe ball pops into the hands of Embley on the run, takes it to 50m and makes no mistake as he kicks a goal. GOAL EAGLESLe Cras is on the burst, he takes a shot from 50m and is offline. He was dumped after he kicked it by Evans, free kick. Le Cras makes amends and kicks a goal. 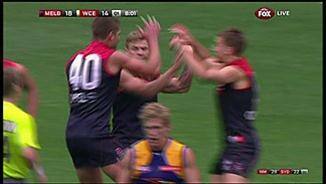 The Demons are showing a lot of heart about themselves at the moment, but are yet to take the ball into attack. 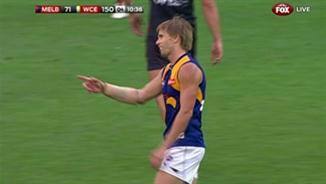 BEHIND EAGLESFrawley pushes Kennedy in the back and the umpire picks out the resulting free kick. He comes in from about 35m out on a slight angle and hooks it way to the left for a point. 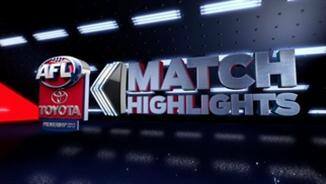 This clash is of vital importance for both clubs who are yet to post a win for the season. Melbourne has had a nightmare start to the season and just want to be competitive. 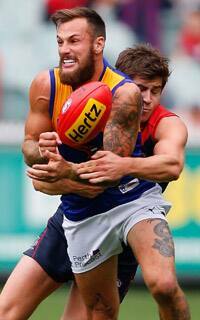 Demons InterchangeJack Viney off due to an injury. BEHIND EAGLESEmbley with a quick shot on goal and it is offline. The ball is bounced in the middle of the ground and we are under way. Welcome to the MCG for the match between Melbourne and West Coast. There are no late changes for either side. The subs are Toumpas for the Dees and Cripps for the Eagles. BREAKING NEWS: Waters is out of the West Coast side as he has injured himself in the warm up. Brennan has replaced him. Welcome to MCG for the Melbourne v West Coast Eagles Round 3 clash. IN ROUND two, Melbourne players managed just 20 minutes of effort before they were blown to pieces by Essendon. Seven days later, they walked off the MCG having lost to West Coast by 94 points after doubling that output and managing a half of competitive football. The Eagles, only up by 10 points at the main break following a remarkably impressive performance by the home side, put together their best ever quarter against the Demons to lead by 72 at the final change. It was an 11-goal-to-one quarter that set up the Eagles' first win for the season, with Daniel Kerr picking up 19 disposals and five clearances before being subbed out of his first game for the year at three-quarter time and Mark LeCras slotting back in with three goals after his round one arm injury. The final score was a commanding 27.15 (177) to 13.5 (83), with Josh Kennedy and Jack Darling kicking five goals each and Dean Cox three. 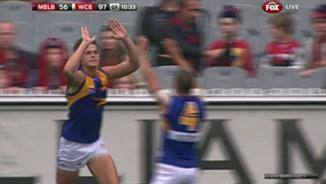 West Coast coach John Worsfold said his players would learn from both the tight and competitive first half and the landslide second. "There's always learning points, from wins and losses and really good quarters and really poor quarters," Worsfold said. 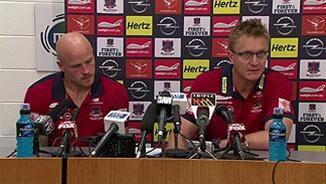 "There's stuff we'll look at it to say why did we score so well in that third quarter. We'll have a look at why. There's little things you can learn about what worked for us there." 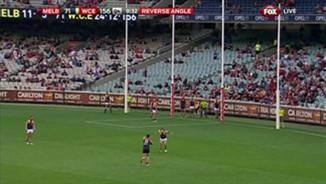 Sadly though, the story of the afternoon was the relative ease the Eagles were able to dismiss the Demons after half time and following onfrom the club's humiliating 148-point loss to Essendon last week and their round one 79-point defeat by Port Adelaide. It also followed a week where the club was again thrust into the spotlight and answers were demanded. CEO Cameron Schwab was asked to resign on Tuesday before the players and coaching staff bunkered down in Sorrento in an attempt to find those responses. The Eagles' half time lead was expected. What wasn't expected was the fact the margin was only 10 points, the Demons had been in front twice and had racked up 30 tackles – only five short of the total they had against the Bombers. Their supporters clapped them off the ground as they headed to the rooms for the half time break, which was also a far cry from the reception they received last Saturday night. Nathan Jones was again a major ball winner with 17 disposals to the main break - 28 for the game – while Jack Viney again played beyond his years after needing his ankle treated early on. Coach Mark Neeld said afterwards while the third quarter was not good enough, the first half was something the Demons could be proud off after the previous week's result. "I know it's a little win. It's a tiny little thing but we were really proud of the response our players gave in the first half and we're driving forward," Neeld said. "We thought it was a tremendous response from what happened last week. "We as a group, and I know this is difficult, but certainly at half time, we were really proud of the fight the boys showed from last week, which was a complete train wreck. "I think we showed today there is certainly enough to keep forging on and working hard and driving these boys as hard as we possibly can. I think they showed that today." Worryingly, Rohan Bail had a concussion test in the second quarter after a history of head knocks but was able to return in the opening minutes of the third. The Eagles lost Beau Waters minutes before the opening bounce because of a calf complaint picked up in the warm up, with Jacob Brennan taking his place. 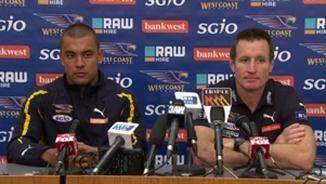 Worsfold said he was in doubt for next Saturday's clash with Carlton at Patersons Stadium.